It’s the New Year and Brian Hendry Interiors Ltd is eager to work towards realising our goals for 2019. Our Employee Forum, held on Friday 11th January, was an excellent way to communicate these ambitions and share important company information with all the staff and site employees who were present. One priority that we have established for 2019 is to secure and complete high quality projects, whilst continuing to foster a responsible attitude towards compliance and competency. These are important subjects within the construction industry, with the FIS recently publishing guidelines—the ‘Product Process People’ Initiative— that its members can implement to improve how they provide evidence of compliance and competence. 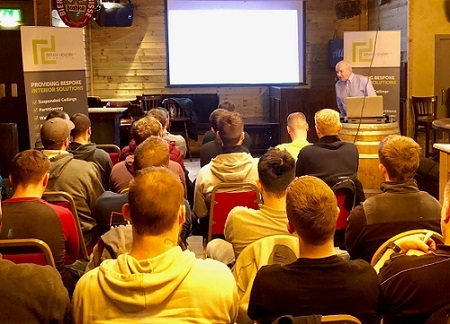 At our Employee Forum, Brian Hendry (Managing Director) reinforced how all company employees can continue to assist with the implementation of relevant guidelines, which uphold our reputation as a compliant and competent specialist contractor. Whether this is achieved by ensuring the completion of all checklists on-site, taking photographic evidence that details the final installation or undertaking/maintaining relevant training qualifications (including CSCS cards). The company has always encouraged employees to grasp opportunities to improve their knowledge and training, realising that it empowers our workforce to complete their required tasks efficiently and effectively. A new initiative that the company will introduce in 2019 is the Fire Performance Labelling Scheme, which was established between the Association for Specialist Fire Protection (ASFP) and the FIS. As a specialist contractor that is often involved in the installation of fire resisting partitions, by placing labels at the appropriate locations, it will advise retrofit contractors to seek advice before taking any action that may adversely impact the partition’s fire integrity. Brian Hendry Interiors has always been committed to ensuring that our finished installations meet each project’s specific requirements and we believe that our long-standing diligence, coupled with our new 2019 initiatives, will continue to support this goal.